Euphemism is the quest of Heroic: Concrete Architecture and the New Boston. If authors Mark Pasnik, Chris Grimley, and Michael Kubo have their way, “heroic,” an adjective that doesn’t yet describe any buildings, will before long replace “brutalist,” an adjective that describes far too many. There is little doubt that, whatever niche success it has enjoyed as a cause célèbre for preservationists, “as a banner for a movement, ‘Brutalism’ was a rhetorical catastrophe.” While the roots of the term—deriving from béton brut, a description of concrete surfaces—are nuanced, its connotations of violence are not. Imagine if current exurban wood-frame home construction were known as “ephemeral,” and you’d be halfway to the problem. Of course, terminology only partially explains the ill repute of brutalist structures. We tend to judge the attractiveness of buildings as we do people: by looking at them, not by learning their taxonomic names. (Gothic architecture has many admirers, if not the warmest of descriptors.) But the term “brutalism” is nonetheless a dark cloud. It is unclear if all of the architects profiled in the book would embrace the new designation “heroic,” but Araldo Cossutta, designer of the Long Wharf Marriott Hotel and several concrete additions to Boston’s Christian Science Center, speaks for many when he says, “I resent the word brutalism being attached to my work in any way.” Perhaps a new term will inspire an opportunity for fresh eyes on these and other structures. The aggressive government-sponsored construction of the 1960s and ’70s, indelibly marked by concrete, aimed to revive a moribund city. And yet, for a while, this was not remotely the case. The result was a unique center of concrete modernism in the United States; no other city boasts a legacy comparable to Boston’s. In town, this has always been a subject of controversy—indeed, derision. The current mayor himself belittled City Hall shortly before occupying it, an easy dig at a widely despised building. And yet Heroic argues that, whether or not Boston’s concrete has been successful, the aims behind it were noble. The era reflected a new approach to urban repair, as opposed to urban renewal, to which it was an intended remedy. Boston was in decline, and concrete construction—or, more to the point, the civic vision guiding it—was to be its rescue. 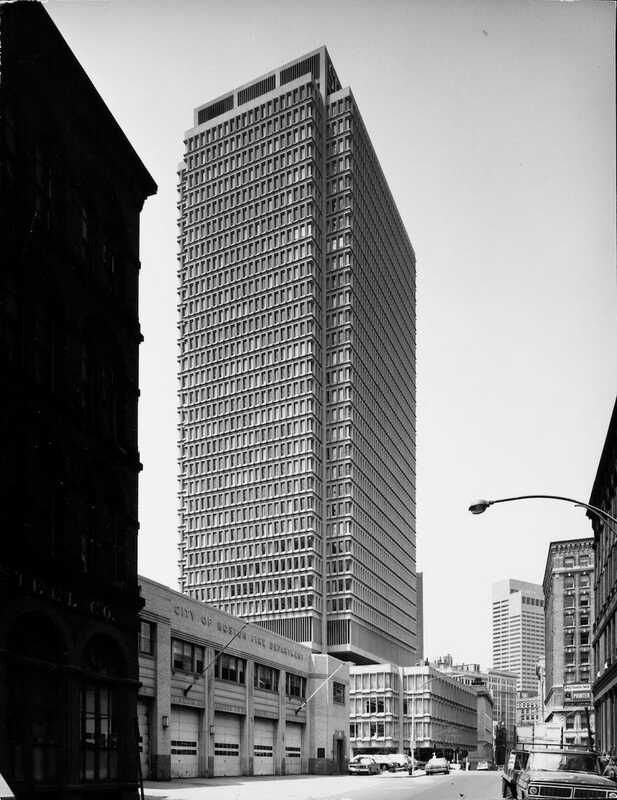 A distinctive set of circumstances generated the rise, and then the fall, of concrete modernism in Boston. The authors of Heroic take great and welcome care in sorting out the many strands, stages, and personalities involved. The effort, which is usually treated as a pre-cast attempt to level the city wholesale and replace it with La Ville Radieuse, actually involved many buildings conceived independently. The majority of architects here, as in any era, rejected vociferously the accusation that they were trying to emulate one another. Indeed, they hoped to avoid the qualities of their immediate predecessors and neighbors. For a long while, the region had benefited little from these connections. This changed after the arrival of Edward Logue as head of the Boston Redevelopment Authority. A considerable portion of the construction occurred under the ambit of a 1965–75 regional master plan spearheaded by Logue, an import from New Haven who had been drawing upon local and national modernists such as Paul Rudolph for that city’s development work. These and many others were enlisted in a string of civic projects within Boston’s regional redevelopment scheme. Some, such as the civic center structures, are familiar: Kallman, McKinnell, and Knowles’s City Hall, Rudolph’s Government Service Center, and the Architects’ Collaborative’s Kennedy Federal Building. Other buildings are less noted—Breuer’s Madison Park High School in Roxbury, Eduardo Catalano’s Charlestown Branch Library. The variety of commissions for the civic center was intended to avoid the wholesale monotony of the rebuilt West End, which had been partially razed in the late 1950s. The placement of Government Service Center in a modest plaza was Rudolph’s deliberate reaction to the perceived excess of the adjoining City Hall Plaza, whose proportions he (and everyone else since) found inhuman. Subsequent designers of modern concrete construction were often explicitly concerned to avoid all of these traits and more effectively integrate new buildings with their surroundings, eschewing isolating plazas altogether. The civic center structures have understandably come to define the character of construction for the entire era. Many locals and visitors perceive the buildings as uniformly forbidding and the surroundings as windswept no-man’s-lands. The latter criticism is warranted, but it may be that the astonishment and relative rarity of an all-concrete neighborhood palate has obscured the considerable differences in style between the stentorian City Hall and the almost shockingly baroque Government Service Center—differences few are likely to notice when traversing the massive distances between them in, say, frigid January. Although the civic center is an unfortunate symbol, it is probably an inescapable one, and for good reason. The Boston area’s concrete construction spree was, after all, inspired by government activism, which proved unpopular across the political spectrum. As other observers have noted, the right’s abiding hostility toward any kind of government action joined rising left-wing ire at elite-driven failure to heed the organic concerns of average citizens, especially poor residents. But, the authors of Heroic show, the effort was intended to please a range of interests, whether or not it was successful. It was not a brief public-spirited detour from an urban history of unfettered private enterprise but rather a break from citywide lethargy, public and private. The civic center, exemplar of governmental megalomania to many, was closely intertwined with aggressive efforts to lure businesses back to a city reeling from loss of industry, the demolition of neighborhoods in the North and West Ends, and the fad for downtown highway construction. While other cities were erupting with skyscrapers in the 1920s–50s, high property taxes and the long, kleptocratic mayorship of James M. Curley had resulted in a skyline topped, until the Prudential Tower’s completion in 1964, with a federal building, the Custom House Tower. The aggressive government-sponsored construction of the 1960s and ’70s, indelibly marked by concrete, aimed to revive what had become moribund. Business executives had a hand in public design commissions. Impressed by the resulting projects, they recruited many of the same or similar architects for their own work. 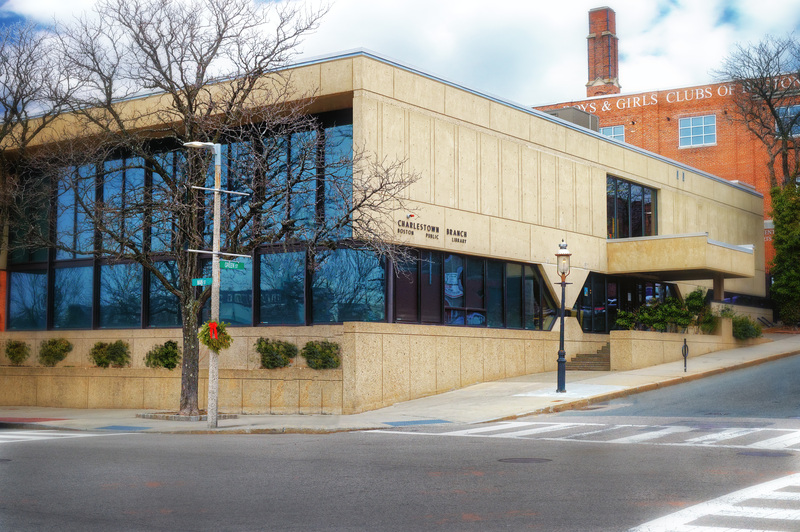 Kallman and McKinnell followed their imperious city hall with the airy Boston Five Cents Savings Bank building (now home to a Walgreen’s pharmacy), a structure that shows how enjoyably and unobtrusively concrete can integrate into the urban landscape. F.A. Stahl and Associates’ State Street Bank Building and Cobb’s Harbor Towers speak again to the aesthetic diversity of concrete. The structures’ intricate facades recall, respectively, steel and stone. Many of the talents sprung from Boston’s academic quadrangles returned to pave them over, with a number of the area’s most significant works of concrete modernism rising at the universities. The banks of the Charles are girded with concrete, such as Pei’s Green Center at MIT and Sert’s School of Law at Boston University and Peabody Terrace at Harvard. Though concrete is routinely scorned as the material of impenetrable fortresses, circulation is a literally central concern of both Pei’s Green Center and Corbusier’s Carpenter Center, each offering open passageways through their middles. No obstructive monoliths here. Other university structures are designed with a strong attention to the pedestrian level: Peabody Terrace includes a retail streetfront and small, usable plaza. The Boston University waterfront project might easily have been a colossus, but Sert made strenuous efforts to vary the heights of the buildings and intersperse modest plazas to avoid this. The undulating lawns adorning the BU law school tower are popular and singular locations along the river, furthering the human-scale goals of the project and again suggesting that much of the trouble with the civic center across the water lies less in the buildings than the groaning landscape. These university structures are not always the most beloved or successful, but the intentions behind their designs reliably reveal nuanced thinking about the needs of particular spaces and their relation to existing buildings and surroundings. The array of designs profiled in Heroic testifies not only to the diverse aesthetics of concrete but also to its wide-ranging utility. If a largely windowless brick sounds like a stereotypical worst of brutalist ideas, it was also ideal for the purposes of the New England Aquarium, designed by Cambridge Seven Associates. Concrete was a structural boon, offering the tremendous strength needed to brace the aquarium’s central tank while also largely eliminating exterior light that would have distracted from the aqueous displays inside. By contrast, Benjamin Thompson and Associates superb building in Cambridge (formerly the Design Research store, now home to a clothing retailer), is an exercise in openness and radical simplicity, with concrete internal columns and floors and only glass otherwise. Mary Otis Stevens and Thomas McNulty’s Lincoln House is concrete both sinuous and cozy. Heroic offers a fine tour of these buildings and more, through a series of essays followed by individual building profiles and, finally and most informatively, interviews with project architects. Occasionally their observations seem drawn from the Highbrow Modernist Quip Book: Michael McKinnell’s arch invocation, “Concrete stood against the stream of what we considered decadently degenerate frippery and surface concerns.” Mostly, however, the commentary is as far from abstract material absolutism or sinister societal manipulation as one can get. As these architects make clear, monumentalism was often an aim of concrete construction, but its intentions sprang from a strong sense of democratic promise. Indeed, monumentalism is a familiar trait in American civic architecture, which seemed to become taboo only in the age of concrete. (No one complains about the imposing qualities of American neoclassicism.) A significant attraction of concrete was the transparency of its exposed materials: its use was not intended as an esoteric trick staged for other architects but as a gesture of openness scrutable to the average observer. While some concrete modern structures are blank-walled, many are riven with glass yet tend to receive almost no credit for the fact. Observers refuse to see the windows for the frames. Of course, many of the era’s good intentions about the arrangement of buildings and space did not translate into good outcomes. Especially ruinous was the idea that public spaces would simply animate themselves: City Hall Plaza is the most obvious failure. Even the designers of consciously smaller spaces often ignored historical lessons about the sort of surroundings that generate street life. There is an unfortunate tendency to judge concrete modernism by these surroundings, though the work functions far more successfully in the context of a bounded streetscape: the east front even of the worst bully of them all—City Hall again—offers a satisfying experience thanks to its border with a traditional set of city blocks. The authors of Heroic appreciate as well as anyone that concrete itself is unpopular, but they also make the important point that it went out of style in part for non-stylistic reasons. In the interviews, it becomes clear that concrete’s undoing was, in considerable degree, its cost. Concrete is usually thought of as a cheap material, and it is if you are just laying down a sidewalk. But large-scale poured concrete construction, which relies upon careful mixes and labor-intensive formwork and finishes, is unquestionably expensive. For a few valiant decades, concrete battled against steel and glass, but, by the early 1970s, it had lost on almost all measures of cost-efficiency and could not hold out against increasing public unwillingness to invest in high-quality civic construction. Even today, with reinforced concrete resurgent as a structural material, supporting many new residential towers, steel and glass offer cheaper facades. There are certainly exceptions and imaginative uses, but a second era of widespread concrete construction seems about as likely as the return of all-marble government centers. Perhaps most are happy about that, but, as unique concrete buildings meet the wrecking ball, it is worth keeping in mind that the comprehensive building plans of one era usually turn into a collection of relics in the next. As far as the remaining buildings go, the book is nuanced: the authors do not suggest that a heroic thing need be worshiped. Concrete construction of the 1960s and ’70s boasts clear problems, sometimes exacerbated by failures in execution, sometimes due to the precise implementation of faulty ideas. The authors also recognize the era’s lessons in how not to go about urban planning and design. Their request is simply for a broader recognition of the hopeful spirit of the era, “a time when civic investment in the public realm was possible and achieved with high standards.” At the very least, theirs is a comprehensive demonstration of the great stylistic variety that characterized concrete work. If this portrait of diversity dulls even slightly the calls for demolition, it would be heroic indeed.